Audeze iSine 20: Best EQ Setting with Cipher Cable? Discussion in 'Portable Headphones, Earphones and In-Ear Monitors' started by DrSteinein, Sep 14, 2018. 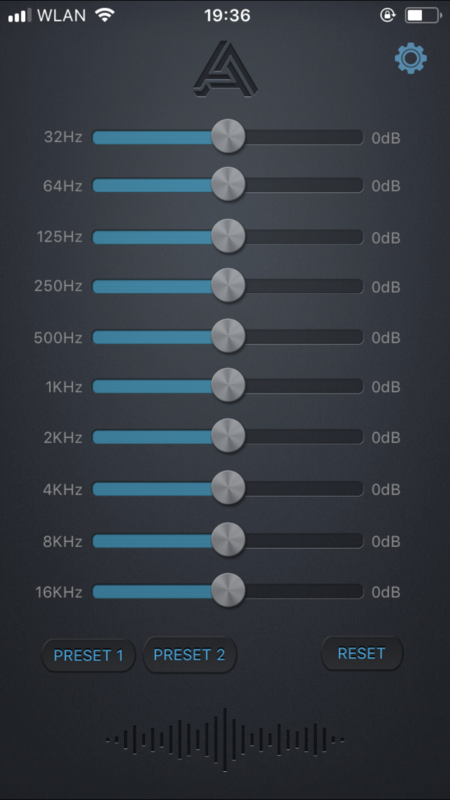 Do dou know the best Setting for the iSine 20 with the Audeze App EQ? Thank you for your helpful response. Im very new about EQ's. Could you give me a clue how the Sound would be flat? From 32Hz to16KHz which settings should i use to make the Sound Flat on the Audeze EQ? Do you think the Cipher Cable has other results than the stock Cable? Because its sounds very different. I have a Cyrus Soundkey Dac and the Cipher has better Bass reaponse and deeper Soundstage than the 100$ external Cyrus Soundkey. For a flat response, considering the median db on the chart is around 61db, adjust each frequency setting to that point as close and you can. The Cypher cable does sound different than the standard cable and we all hear certain things differently, which is why I said to adjust the sound to your liking after flattening the sound. Yeah, +/- 6db is fine, just make it as accurate as possible. Sorry, but I cannot tell you what they are individually, as they are your earphones and your ears. So you said every frequenz is +6 db or -6db or in between +6 and -6? Between -6db and +6db, however you want to adjust each band to make it as flat as you want. Thank you very much, its just a lot of choices. I hoped for a straightforward solution like put 5db on 32Hz and -2db on 64Hz. But between -/+6 db is a great advise to adjuest. Thank you for your help!! Yeah, sorry about not being able to provide more specific steps, as the iSine20 is a completely open-back IEM, which does not help with adjusting EQ for specific or general genres. You will eventually find your flat first preset and preferred second preset, so just continue to enjoy and adjust the sound to however you want it. Last Question, sorry. Im suprised that the isine sound with the cipher cable sounds more deeper and textured than with the cyrus Soundkey. On other Side the Soundkey has a more wide open sounding and more detailed. The voice gets more information to listen. Do you think if i buy a used iBasso DX90 or Fiio Alpen E17 with high gain it would be sound better than with the cipher cable on my iPhone 7? Or should i still hold on my iphone and dont buy a new DAP? Last Question, sorry. Im suprised that the isine sound with the cipher cable sounds more deeper and textured than with the cyrus Soundkey. On other Side the Soundkey has a more wide open sounding and more detailed. The voice gets more information to listen. Do you think if i buy a used iBasso DX90 with high gain it would be sound better than with the cipher cable on my iPhone 7? Or should i still hold on my iphone and dont buy a new DAP? Save your money and stick with the iPhone/Cypher/iSine20. By the time you are ready to upgrade, you will have enough money for at least a used iBasso DX200. Is the iBasso DX200 so much better than the DX90? He said the iSine 20 benefit much from "Power" So if you give the Headphone more Gain and Output to the iSine it will get much deeper better Sound. So i has hoped for an "cheap" altenative to make the Sound clearer and deeper Bass than with the Cipher Cable. Do you think a Objective2 O2 Amp or O2 DAC could do this? Or just save the money? No, just save the money.